Date : AD 265 to 267. Size : 18.0 x 20.8 mm. Weight : 3.87 grams. Reference : Sear-10368. Gobl-583a. This variety appears to be missing from RIC, but appears to be an accidental omission rather than a rarity. The closest reference I can find is RIC V, pt. 1, page 156, #287, where it is listed as a type for Rome mint but without a the E control mark in the right field. A coin with the identical reverse type, including the E in the right field, is listed for Saloninia on page 194, #29, as Rome mint. Grade : XF with a glossy very dark brown patina. 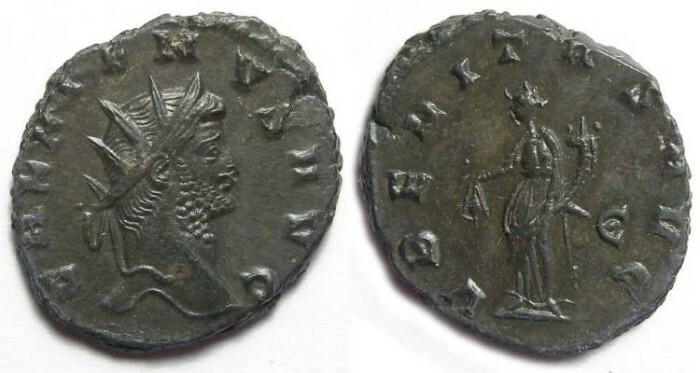 Obverse : Radiate head of Gallienus right, with GALLIENVS AVG around. Reverse : Uberitas standing left holding a purse (which Sear feels might be a cows udder) and cornucopiae, with VBERITAS AVG around, with the officia mark E in the right field (E is the 5th officina).